The South Korean company LG current flagship V40 ThinQ is now on sale in India. The LG V40 ThinQ smartphone is priced at Rs 49,990 and comes with 6GB RAM and 128GB internal storage. This premium smartphone can be purchased exclusively through Amazon India website. The handset comes with total five cameras. 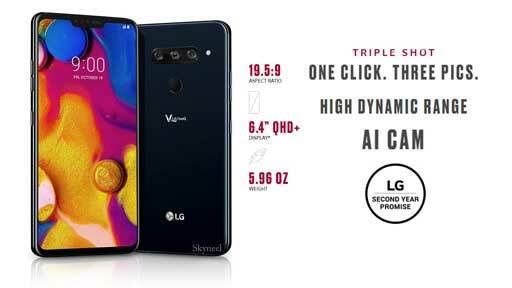 LG V40 ThinQ, latest smartphone launched by the company and available at Amazon.in website. This dual sim smartphone comes with 33000mAh battery which is running on Android 8.1 Operating System. This smartphone is priced at Rs. 49,990. This smartphone available in colors Grey, and Blue option in the country. This phone comes with a 6.40-inch touchscreen display with a resolution of 1440 pixels by 3120 pixels. The device offers a 32-bit Quad DAC, IP68 water and dust resistance, and MIL-STD-810G compliance. You will get 10 percent instant discount (up to Rs. 1,500) on LG V40 ThinQ if you have HDFC credit and debit cards. You can also get one time free screen replacement of worth Rs 16,750, extra exchange offer of Rs 5,000, and No Cost EMI on all major credit cards and select debit cards. Any consumers will also get No Cost EMI option via Bajaj Finserv EMI cards. It also offers the boombox speakers like the LG G7+ ThinQ. The LG V40 ThinQ smartphone comes with 6.4-inch P-OLED Quad HD+ display, and protected by a Corning Gorilla Glass 5. This smartphone is powered by 10nm Qualcomm Snapdragon 845 octa-core chipset, coupled with an Adreno 630 GPU. This smartphone comes with 6GB of RAM and 64GB/128GB of inbuilt storage capacity and running on UX 7.1 based on Android 8.1 Oreo Operating System. If we talk about the camera of LG V40 ThinQ, this smartphone comes with triple-lens camera system, comes with 12MP sensor, a 16MP sensor and a 12MP sensor. You can also get front camera with combination of an 8MP + 5MP dual-camera setup. The dimension of this smartphone measured in 158.8 x 75.7 x 7.6mm with 169g weight. The dual sim GSM and GSM smartphone that accept Nano SIM and Nano SIM. If we talk about the connectivity options, include Wi-Fi 802.11 a/b/g/n/ac dual-band, 4G VoLTE, NFC, Bluetooth 5.0, GPS with A-GPS, GLONASS, Galileo, and USB Type-C. The LG V40 ThinQ smartphone comes with Proximity sensor, Accelerometer, Gyro, Barometer and fingerprint sensor. This smartphone comes with 3,300mAh battery with Qualcomm Quick Charge 3.0 and fast Qi wireless charging support. Must Read: Nokia 8.1 Vs 7.1 – Which is the better Smartphone? Memory Available in – 6GB+64/128GB Storage capacity. Display 6.4-inch P-OLED Quad HD+ display, 1440 x 3120 pixels resolution with 19.5:9 aspect ratio. Dimensions Height:158.8 mm, Width: 75.7 mm, Thickness: 7.6 mm, Weight: 169 g.
Camera 12MP Primary with f/1.9, 1.0-micron and 16MP Secondary Camera. Front camera – 8MP with f/1.9, 1.4-micron primary camera and a 5MP with f/2.2, 1.4-micron secondary camera for taking selfies. Battery 3300mAh with Qualcomm Quick Charge 3.0 and fast Qi wireless charging support. Connectivity Dual Nano SIM. Supports 3G, 4G, Wi-Fi 802.11 a/b/g/n/ac dual-band, 4G VoLTE, NFC, Bluetooth 5.0, GPS with A-GPS, GLONASS, Galileo and USB Type-C. You can get Proximity sensor, Accelerometer, Gyro, Barometer and fingerprint sensor. Price & Color Priced: 6GB+64/128GB available at Rs.49,990. Color: Grey, Blue.